We could have a vastly more usable PT network; PTV has a plan. It just needs funding. Getting around Melbourne’s inner-suburbs without a car is pretty easy, thanks to a reasonable network of frequent trams. 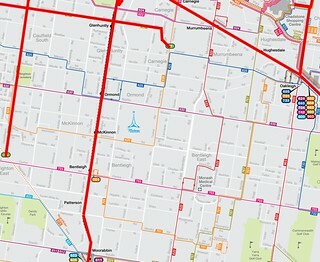 In some areas, such as around Prahran, the trams, trains and buses form a grid, making almost any local trip within that area very easy. Getting around Melbourne’s middle and outer-suburbs without a car is generally a nightmare. There are some rail lines, but for most trips it’s buses, and they are hopelessly infrequent — generally only hourly on weekends, and only half-hourly on weekdays. It’s no secret then that areas of good public transport tend to have lower rates of car ownership — the excellent Charting Transport blog explored this in detail a while back. Of course, there are other factors such as urban planning — are the things you want/need easy to get to without a car, including by walking? But most of Melbourne currently misses out on frequent services of the type that you can use without looking at a timetable, and without a long wait (particularly if connecting off another service). A few Smartbus routes have been a step in the right direction, and they’re popular, but still leave huge gaps in the frequent network. A network of more than 30 bus routes running every 10 minutes would criss-cross much of Melbourne within less than a decade under ambitious plans produced by Public Transport Victoria. This kind of upgrade is really important: along with train and tram upgrades proposed, it gives way more suburban areas a much more useable network. The information has come out in a document which is part of East West Link travel forecasts. It’s a bit vague because the details are in tram and bus plans prepared by PTV but not released — only the train plan has been made public. The most interesting bit is around buses. Remember that many areas of Melbourne will never have trains and trams, not even under the most ambitious expansion plan imaginable. A LOT of suburbs will remain beyond walking distance to stations and tram stops, and need frequent bus services. The plan sorts buses into several categories, and attaches minimum standards to each. Yes, by 2031, the proposal is to have over 120 Melbourne bus routes running every 15 minutes. This is critical for the overall public transport network. 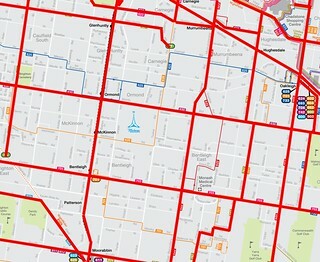 The mass introduction of Smartbus and Direct routes every 10 and every 15 minutes would vastly expand the “turn up and go” anywhere-to-anywhere network across Melbourne, making it possible to use public transport for a lot more trips than at present. Here’s how my neck of the woods looks at present: 7-day 15 minute services (all modes) — the current situation on the left, and if the PTV plan were implemented on the right. At present, if your trip isn’t entirely along a tram or train line, you’ve probably got a long wait ahead of you. Going to most areas, it’s hopeless — so most people drive, and will often pack their driveway with one car per adult, putting a big strain on household budgets. With the PTV plan implemented, a lot more journeys are possible without long waits, because a lot more areas are within walking distance to a frequent service. This includes being able to easily get to your nearest shopping centre and/or railway station without having to drive. A frequent network is the type of thing needed to let households really reduce their car ownership and usage. It would bring Melbourne more into line with other big cities around the world, particularly in Europe, where the fast frequent backbone (principally heavy rail) is supported by connections to a network of frequent buses and trams across urban areas. And a lot of it is achievable in the short term by making better use of fleet and infrastructure, in particular by getting the large number of vehicles currently in depots outside peak hours and getting them out into service more of the time. The only question is when will the politicians take note and fund this? Presumably, who ever is elected in 2030 will start to think about implementing the plan. Regarding: “And (more embarrassingly) it still shows the Hope Street 509 route, cut amid a blaze of publicity in 2012”. That shows that the people who design the system for us don’t actually use it. 2031 and they still won’t have frequent buses all the way up Nepean Highway to Elsternwick? Wait, never mind, I’ve looked more closely and although new bus routes are listed, it’s not indicated how existing bus routes may change. One would assume they wouldn’t keep all the existing bus routes the same until 2031. Two issues come to my mind. #1, The SmartBus technology needs to become standard across all buses. Especially the PIDS. both on the bus and at bus stops. ++ The bus itself is short of only a $100 dot matrix display. The frequency of the SmartBus and the new route sections would be of great interest to the new customers. You can not deny that the technology is also a very popular feature of the bus too, and would attract many full-fare paying customers directly because of the technology. #2, I fully support the gripe of John. Some of the most common sense upgrades in my mind is to fill the many dumb gaps. The one highest in my mind is the route #3 needs to connect with the East Malvern Railway station, along with the Alamein line being extended that one stop also to East Malvern. It would be great if public transport could in some way, pay for itself. That is the big problem with PT expansion, the fact that it is such a burden on the taxpayer. While I do not advocate increasing fares to pay for this, I will advocate strongly on a focus to fill up the empty outer ends with more of those who journey only in the outer regions. The cost to operate #3 trams and Alamein trains that one extra stop each, would be greatly offset by the massive surge in customers of whom I expect to gain from such a change. 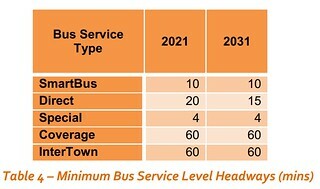 By doing the string of like improvements, should have the double sided effect of #1, providing people with a far better transport network, and #2, a transport system which can better fund its way which can only help the PTV with their expansion into ares which need greater subsidies when done later in time. You’re not taking into account that people choose whether or not to live in a PT-rich suburb according to how much they value it. So extending good PT across the areas which don’t currently have it won’t get the same amount of uptake in those areas as there is in the current PT-rich areas. As some other commenters have said, there are obvious gaps in the existing network that should be plugged first. It is interesting to see the Telebus is mentioned. As a regular Telebus user I can say that the persistent rumour is that Ventura are not really interested in continuing to run the service when their contract runs out. So some people are concerned that Telebus may be no more. One of the problems with the service is that as well as offering a pick-up, droop off service the bus also has a number of fixed stopping points, however many of these are within easy walking distance of a main road. In addition, due the varying nature of the route it would be imposable to run it more frequently than every 30 minutes. Therefore it could be argued that the Telebus should be replaced by more frequent main road services. If this happened however there would be some people, including myself, who would not be able to physically get to a main road stop. Even though I usually get the bus from a stop the stop that I use is 1km from a main road with significant hills in the way. I have been thinking it might be more cost effective and better for the passengers, as well as the environment, if a coverage service such as this was replaced by a subsidised taxi service for people that physically need to use it. The service could be offered for the same cost to the passenger as the Telebus is now but money could be saved overall as there would be no need to run mostly empty buses for the few people that need to use them. It would also mean that passengers would have a shorter trip to get to the local shops or other forms of PT to take them elsewhere. The reliability of the taxi system especially in regard to bookings in advance would need to be improved before this was possible. Also at present the Telebus routes are the only bus routes to run to Mooroolbark station on a Saturday. The two main road routes to the station only run five days a week and therefore there are no buses to the station on a Sunday. im still a little confused about the telebusses. What are they? Telebuses have a scheduled route, but will divert off that route on request. Particularly useful in areas where those with mobility difficulties might have trouble reaching a bus stop, such as very hilly suburbs. I’m very much supportive of most PT being organised into a fast frequent grid, along main roads. 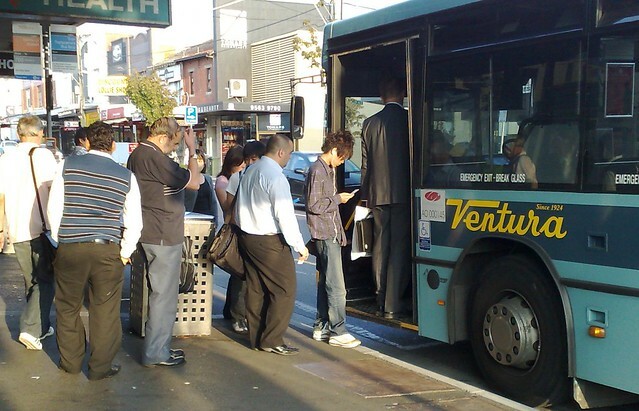 Telebuses and other measures are needed to ensure that in that scenario, people who would have problems getting to bus stops still have a service they can use. The obsession with grids and frequency suggests Mr Walker’s book and blog are having plenty of impact! AS for implementation of this terrific plan, it’s easy to be negative, but I suspect the state government will change this November, the east-west link will be blamed for the Coalition’s loss, and a new era will begin in which treating public transport with reverence is the new black of Victorian politics. Two consecutive elections with PT as a major factor could be enough to install it as a sacred cow for a generation.